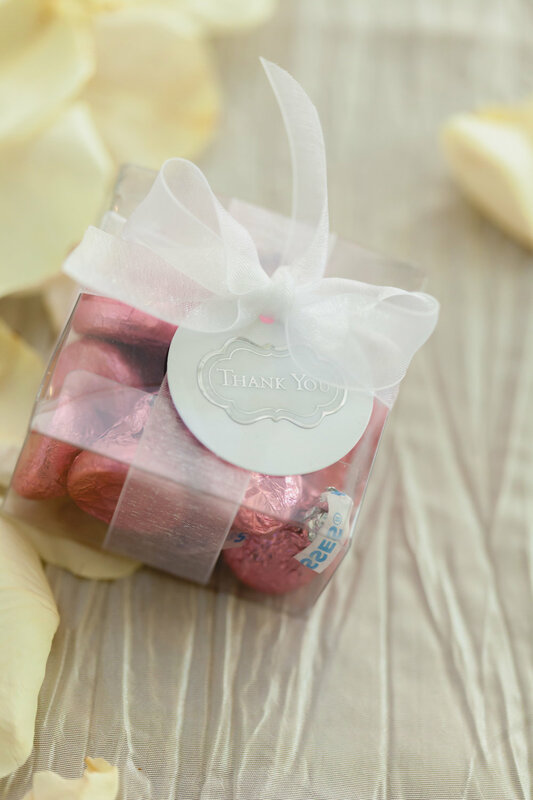 Wedding favors are a kind gesture to show your guests that you appreciate them coming to share in your special day. Although these are typically small items with little to no expectations in terms of quality, we don’t want our kind gesture to go to waste on items that will end up in the trash by the end of the night. Having attended hundreds of weddings, we’ve shared some of our favorite wedding favors below! Despite a few people who may have to refrain due to food allergies, edible favors are always appreciated and many times consumed before the night is over. When speeches go too long, or after a few songs on the dance floor, a tasty treat can be the pick-me-up that puts some pep back in your guests’ step. It’s hard to go wrong with cookies or chocolate, but if you would rather choose an item that makes more sense for your wedding, try picking something that fits with your décor or menu. If your main dish or appetizer employed the use of a delicious olive oil, give your guests mini bottles of olive oil attached with a short message and recipe they can use at home. Syrup, mini champagne bottles, or cocktail kits are also fantastic choices. As the bride and groom, wedding photos are a must have, but often times our guests who had a great time would also like a few pictures to remember all the fun they had. Since it’s unlikely that photos of every single guest will be captured by the photographer, one option is to set up a photobooth with prints. As a favor, give your guests magnetic sleeves they can use to frame their photo strips. 9 out of 10 times these will end up on the fridge or somewhere visible for years to come, regardless of how close they were with the bride and groom. Want the satisfaction of actually seeing your favors being used? Then give your guests something that will come in handy during the wedding. In last week’s blog we talked about giving lighters as a favor to assist in your sparkler-lit grand exit. Whether your wedding involves sparklers or not, there are plenty of details that make your wedding unique that can provide the perfect opportunity for accompanying favors. Are you having a beachfront wedding? Sunglasses or a parasol would make excellent gifts while ensuring all your guests can actually see the wedding without being blinded by the sun. How about an outdoor Fall or Winter wedding? A blanket or gloves will keep everyone warm, focused, and praising your thoughtfulness. No matter how amazing or useful you think your wedding favors are, there will still be many that go unused or lay forgotten at the end of the night. Instead of taking a risk on favors that may or may not be a success, make certain that your wedding favor budget is going towards a good cause with a donation in honor of your guests. Select a charity that hits close to home to you and your spouse, a local charity, or consider providing a list and allowing your guests to choose for themselves. Your guests may not have something physical to take home, but they will leave with the satisfaction and gratitude of knowing their donation is helping make a difference. Also, zero chance of wasted favors! Our wedding days are one of the most special days of our lives, so it’s only natural that we would want something physical to remember it by. However, when it comes to our guests, the thing they will keep and cherish the longest is the fun memories they made during the wedding. Focus on making the night as fun, memorable, and comfortable as possible for your guests, and no matter what favors you choose, they will always remember the sincere effort you put into making your wedding an incredible experience for everyone!